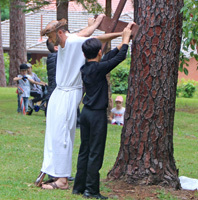 March issue of the Marist Laity Australia bulletin is now available. Sr Margaret Cummins SM / Fr Paul Mahony SM presides at the Macquarie Park interment. Members of the Australian Unit of the Marist Sisters gathered at St Peter Chanel's church, Woolwich, NSW on Mar 30 to farewell their oldest Sister, Margaret Cummins SM, aged 94. In her seventy-four years as a Marist Sister Crookwell-born Sr Margaret had worked in Fiji, New Zealand and Australia in a wide range of teaching roles before retirement at Woolwich and Hunters Hill in recent years. 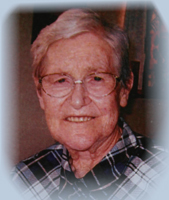 She died peacefully at St Anne's Nursing Home, Hunters Hill, on Mar 21. May she rest in well-deserved peace. 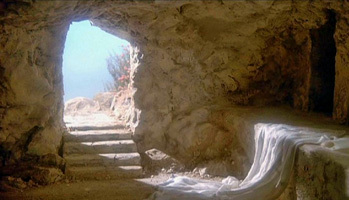 He has risen as He said! 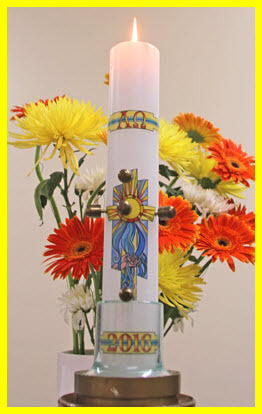 Easter reflections from Fr Michael Whelan. 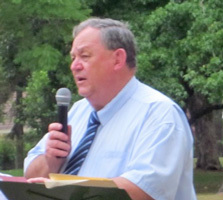 From Sydney's Aquinas Academy, Fr Michael Whelan offers two reflections for Easter: 'Gospel notes for Easter Sunday' and 'Three Pillars'. 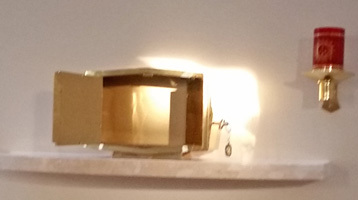 Holy Saturday, and across the world tabernacles are empty, awaiting the moment of Resurrection. Pictured: the Marist tabernacles of 'Montbel', Hunters Hill, and Notre Dame de France, London. 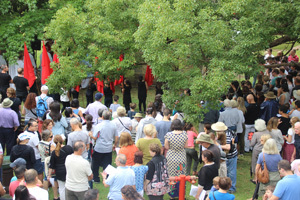 Hundreds of local Christians participated in the annual combined churches Way of the Cross on Good Friday at Hunters Hill. 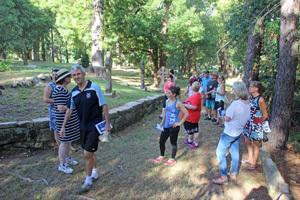 Beginning at All Saints church and pausing at other churches and selected sites along the way, the walk concluded with the Calvary scenes and burial in the grounds of Villa Maria monastery. 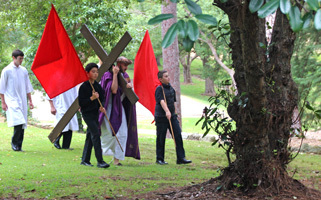 The annual combined churches Way of the Cross will again be held at Hunters Hill, finishing in the grounds of Villa Maria monastery. As the universal Church celebrates the Solemnity of its Patron and Protector (Mar 19), a statue of St Joseph and Child stands neglected and overgrown in a remote corner of France. Erected in the 1850s to watch over the newly-built 'Montbel' Marist residence and later formation house and retirement place, the statue was abandoned during the 1903 government expulsion of Catholic religious (including Marists). 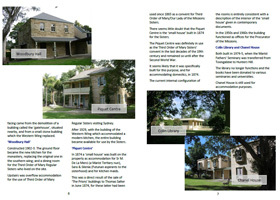 The memory of 'Montbel' (near Toulon in the south-east of France) has been perpetuated in the naming of Marist buildings at Hunters Hill, N.S.W., Australia. 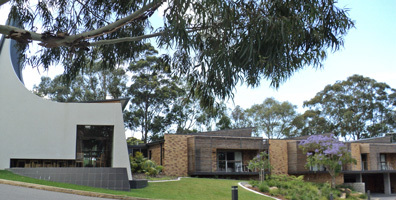 The present - and third - 'Montbel' was opened in Nov 2009 and is home to retired Marists as was its foundational namesake. Following the recent general elections in Myanmar, new presidential leadership has been established. President U Htin Kyaw has been a long-time member of the National League for Democracy and trusted associate of Daw Aung San Suu Kyi, whilst Vice-President Henry Van Thio is a committed Christian.
" 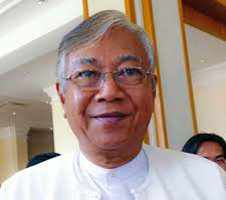 The NLD’s overwhelming majority in the two combined houses of parliament ensured that U Htin Kyaw, a 69-year-old academic and long-time aide of Daw Aung San Suu Kyi, would become the NLD leader’s proxy president to succeed ex-general U Thein Sein whose five-year term ends on March 30. 'Today's result is a triumph for Daw Aung San Suu Kyi,' U Htin Kyaw told reporters before getting into his car and leaving parliament following the vote. Ex-General U Myint Swe, the military’s candidate, was elected first vice president with 213 votes. The appointed military bloc in parliament holds 166 seats, 25 percent of the total, while the military-backed USDP led by the outgoing has 41 seats in the two houses. Henry Van Thio, an NLD upper house MP and an ethnic Chin Christian, was elected second vice president with 79 votes. The Marist Province committee for Justice, Peace and Integrity of Creation (JPICC) advises of a new web site highlighting the plight of Pacific and other maritime countries in the face of climate change. 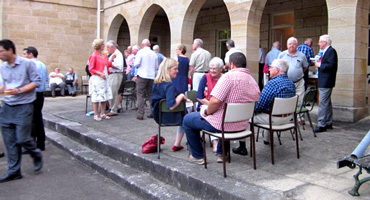 Fifty Marists and friends gathered at Villa Maria monastery, Hunters Hill, on Mar 11, for the launch of two books from Marist authors and researchers. Fr Andrew Murray’s ‘Thinking about Political Things: An Aristotelian Approach to Pacific Life’ is a work of political education intended for peoples of the Pacific islands, but applicable to other traditional and small communities. Fr Charles Girard's compilation of 'Letters from the Marist missionaries in Oceania, 1836-1854' is a selection of correspondence from the pioneer Marists in the Pacific during the period of the generalate of Marist Founder, Jean-Claude Colin. 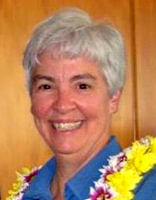 Congregational Leader of the Missionary Sisters of the Society of Mary, Sr Georgeanne Marie Donovan SMSM, has been re-elected at the General Chapter of the Sisters this week. 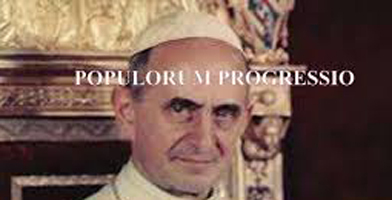 For more on the Sisters and their General Chapter click here. 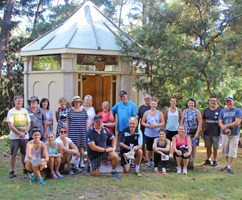 MCC immersion program participants at St Joseph's chapel (1863) in the grounds of Villa Maria, Hunters Hill / visiting St Peter Chanel chapel. 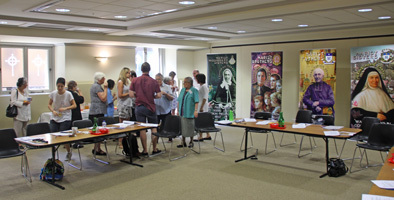 Twenty staff members of four colleges founded by the Marist Fathers and Marist Sisters.are gathering this week at Villa Maria monastery, Hunters Hill, NSW, for an immersion in Marist charism and culture. Selected from all areas of the school staffs (teaching, administration and support) the group is receiving input from Marist Family members reflecting on Marist history, values and spirit. 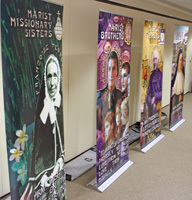 The Marist Charism & Culture 'immersion week' is intended to be the first of a series for the participating colleges: St John's College, Lismore, NSW; Marist Sisters' College, Woolwich, NSW; Holy Spirit College, Bellambi, NSW; Marist Regional College, Burnie Tas. Above: Eucharist with Fr Gerard Hall SM. 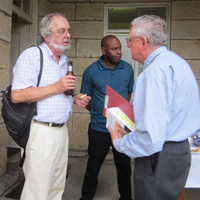 Below: MCC event convenor, Kim Evans / ... Fr Peter McMurrich SM with participants in the Woodbury Hall venue. 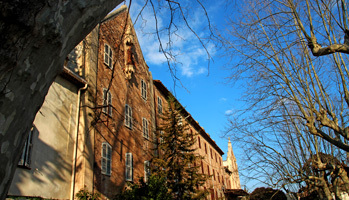 | Walking tour of the monastery's historic grounds. 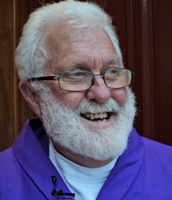 We congratulate Fr Kevin Bates SM, parish priest of Holy Name of Mary parish, Hunters Hill/Woolwich, NSW, who has been appointed to lead the Northern Deanery of the Archdiocese of Sydney as its Dean. The appointment of a religious order priest to such a role is rare and is a testimony to Fr Kevin's standing among the priests of the local deanery. 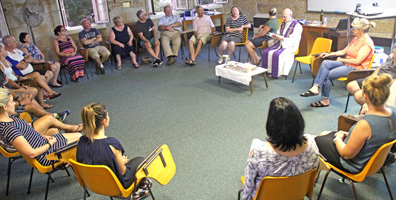 The appointment follows a major reshaping of Sydney's deaneries and will find Dean Kev keeping a brotherly eye on fourteen parishes in the area. 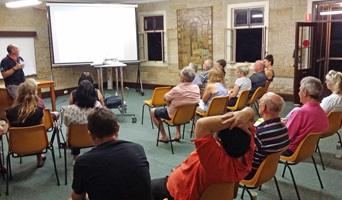 Another group of mostly lay Marists gathered at St Patrick's, Church Hill, on Mar 03 for the third of the current sessions of 'The Liveable Spirit' program on Marist spirituality. Coordinator was St Patrick's staff member, Sr Fidelis McTeigue SM. Representative of the various Marist branches (priests, brothers, two orders of sisters and laity) spoke of the life and spirit of their respective founding personalities. An afternoon workshop, led by Dr Liz Lamb, focussed on practical aspects of living out the 'liveable spirit'. 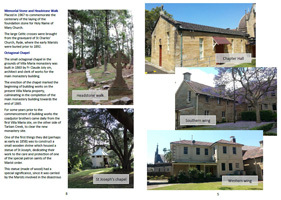 Informative and colourful - the newly-published guide for walking tours of historic Villa Maria monastery and grounds, Hunters Hill, NSW. 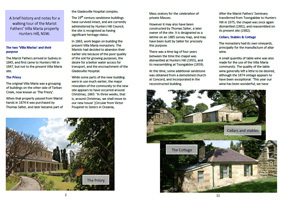 Authored by province archivist, writer and historian, Fr Peter McMurrich, with design by Fr Ron Nissen, 'A Guide to Villa Maria' will enable visitors to discovery the richness of this iconic Marist precinct.